The major indexes failed to hold onto early gains as first quarter earnings season kicked off on Monday. Stocks stumbled into the start of earnings season on Monday, with early gains evaporating by the end of the trading session. 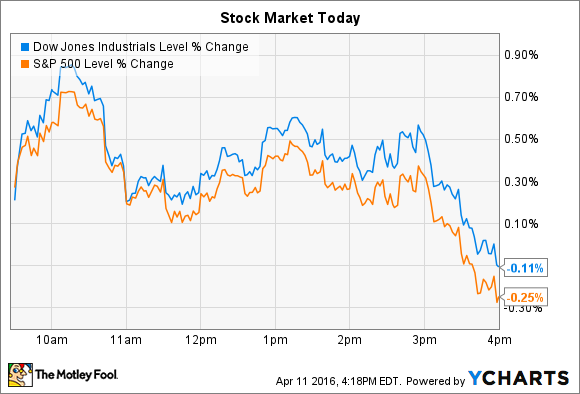 Despite opening higher by almost 1%, the Dow Jones Industrial Average (DJINDICES:^DJI) had lost 21 points, or 0.1%, by the closing bell. The S&P 500 (SNPINDEX:^GSPC) shed six points, or 0.3%. Major earnings announcements are on tap for the next few days, including multiple financial and banking giants. In the meantime, stocks making notable moves included Hertz (NYSE:HTZ), which dialed back its sales and profit outlook, and MannKind (NASDAQ:56400P706), which was set to announce a new plan for extracting sales growth from its diabetes management drug Afrezza. Hertz shares fell over 11% on Monday to bring their one-year loss to a brutal 58% after the car rental giant issued a warning about its operating results for the current quarter. The market is awash in "excess industry capacity," executives said in a press release, which is forcing competitors to slash prices. As a result, Hertz revenue per available car day (RACD) should be roughly flat for the full-year, compared to its prior forecast of about 2% growth. "We are disappointed that the pricing pressure experienced late in 2015 further intensified in the first quarter of 2016," CEO John Tague explained. Hertz dialed back its first quarter earnings projection as well but affirmed its full-year forecast of $1.65 billion of adjusted earnings at the midpoint of guidance. To achieve that result, the company is counting on selling conditions to improve over the next few months. "We believe that industry capacity will likely moderate as seasonal demand improves, establishing the foundation for a relative improvement in pricing as we head into the peak summer season," Tague said. The good news is that Hertz's costs are falling, while its customer satisfaction scores are headed higher. Those gains are being offset by cutthroat pricing from competitors, though, and there's no evidence that this negative trend will quickly reverse itself. Biopharmaceutical company MannKind saw its stock spike 25% in advance of a presentation management announced to discuss business plans for the insulin drug Afrezza. The jump has contributed to a wild ride for shareholders, who are now up slightly year-to-date after the stock lost more than 50% early on in the year. Afrezza has only recently come back under MannKind's control, one of the few bright spots that the company highlighted after an especially rough fiscal year for the business. Net losses rose to $370 million in 2015 from $198 million the prior year as operating expenses ballooned. Former partner Sanofi couldn't find a winning formula for commercializing Afrezza, so it announced in January that it was handing the business back to MannKind. Thus, Monday's stock jump wasn't powered by rising optimism that MannKind's financial struggles are now over. Instead, investors as a whole likely dialed back their short position -- which recently registered at almost 50% of the float -- so that they aren't so exposed to a price swing should the market react favorably to details coming out of MannKind's Afrezza presentation.